The 2001 Atlanta Braves season marked the franchise's 36th season in Atlanta and 131st overall. The Braves won their tenth consecutive division title. The season saw the team finish first in the NL East Division with an 88-74 record – the worst among playoff teams in 2001, and also the worst record for the Braves since 1990 (meaning the worst record through their run of 14 consecutive division titles starting in 1991. Not counting the strike-shortened 1994 season). Atlanta finished the season with just a 2 game division lead over the Philadelphia Phillies. 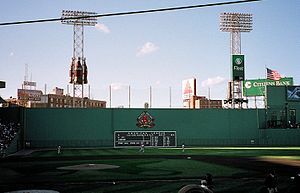 The Braves playing against the Boston Red Sox during a 2001 away game at Fenway Park. The Braves swept the favored Houston Astros in the NLDS before losing to the eventual World Series champion Arizona Diamondbacks in the NLCS 4-1, in which Randy Johnson and Curt Schilling notably dominated Atlanta's offense. October 31, 2000: Bobby Bonilla was Released by the Atlanta Braves. December 13, 2000: Rico Brogna was signed as a Free Agent with the Atlanta Braves. January 26, 2001: Steve Avery was signed as a Free Agent with the Atlanta Braves. March 30, 2001: Steve Avery was released by the Atlanta Braves. The Braves played the Mets in the first game in New York after the attacks on the World Trade Center on September 11. The game was played on September 21 and it was a 3-2 victory over the Atlanta Braves. A lineup card for a 2001 spring training game between the Atlanta Braves and St. Louis Cardinals. May 10, 2001: Aaron Small was signed as a Free Agent with the Atlanta Braves. June 22, 2001: John Rocker was traded by the Atlanta Braves with Troy Cameron (minors) to the Cleveland Indians for Steve Karsay and Steve Reed. July 5, 2001: Ken Caminiti was signed as a Free Agent with the Atlanta Braves. July 31, 2001: Rey Sánchez was traded by the Kansas City Royals to the Atlanta Braves for Brad Voyles (minors) and Alejandro Machado (minors). August 7, 2001: Quilvio Veras was released by the Atlanta Braves. August 31, 2001: Julio Franco was purchased by the Atlanta Braves from the Mexico City Tigers (Mexican). Atlanta wins the series, 3-0, over the Houston Astros. ^ "Bobby Bonilla Stats - Baseball-Reference.com". Baseball-Reference.com. ^ "Rico Brogna Stats - Baseball-Reference.com". Baseball-Reference.com. ^ a b "Steve Avery Stats - Baseball-Reference.com". Baseball-Reference.com. ^ a b Rubin, Adam (May 2, 2011). "Phillies crowd erupts in 'U-S-A' cheers". ESPNNewYork.com. Archived from the original on June 15, 2011. Retrieved May 2, 2011. ^ Inc., Baseball Almanac,. "2001 Atlanta Braves Roster by Baseball Almanac". www.baseball-almanac.com. ^ "Aaron Small Stats - Baseball-Reference.com". Baseball-Reference.com. ^ "John Rocker Stats - Baseball-Reference.com". Baseball-Reference.com. ^ "Ken Caminiti Stats - Baseball-Reference.com". Baseball-Reference.com. ^ "Rey Sanchez Stats - Baseball-Reference.com". Baseball-Reference.com. ^ "Quilvio Veras Stats - Baseball-Reference.com". Baseball-Reference.com. ^ "Julio Franco Stats - Baseball-Reference.com". Baseball-Reference.com. Wikimedia Commons has media related to 2001 Atlanta Braves season.